The mammalian clade Xenarthra (armadillos, anteaters, and sloths) has a long history in comparative anatomy. Here, we review past developmental studies on Xenarthra and extend previous observations on the development of one of their most iconic anatomical features, the xenarthrous vertebral articulations. While xenarthrous vertebrae have been known to researchers since the first descriptions of xenarthrans, intermediate vertebral conditions remain unknown in the fossil record, and uncertainty remains regarding the development of the involved articulations. 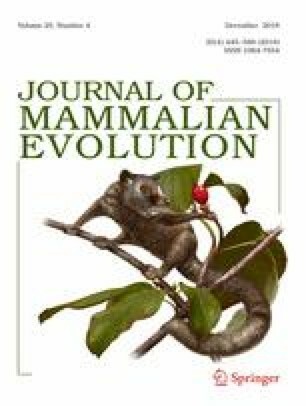 We used developmental and morphological techniques to provide a novel developmental perspective on the evolution of xenarthrous morphology. Our results highlight that within the xenarthrous articulation, the early-developing metapophysis is the major component, and the anapophysis is the supplementary component, which is an arrangement with both functional and historical implications. Our observations do not support the theory of sacralization as the evolutionary origin of xenarthrous articulations. The online version of this article ( https://doi.org/10.1007/s10914-017-9412-y) contains supplementary material, which is available to authorized users. We are grateful to Peter Giere and Frieder Mayer (Museum für Naturkunde, Berlin), G. Verdon, M. Herbin, C. Bens, F. Renoult, C. Denys, and J. Cuisin (Museum National d’Histoire Naturelle, Paris), Roberto Portela Miguez and Louise Tomsett (Natural History Museum, London), Georges Lenglet (Institut Royal des Sciences Naturelles de Belgiques, Brussels), and their colleagues for access to comparative material. For access to material and facilities, we thank Richard Truman (LSU School of Veterinary Medicine, Baton Rouge, Louisiana), the Laboratory of Paleontology and the Institut des Sciences de l’Evolution de Montpellier. A. Heaver (University of Cambridge), Nikolai Kardjilov, and all the staff of the Helmholtz Zentrum (Berlin), R. Abel and R. Garwood (Natural History Museum, London), R. Lebrun (Institut des Sciences de l’Evolution de Montpellier), Ross MacPhee, Nicole Edmison, and James Thostenson (American Museum of Natural History, New York), Blake Dickson (Museum of Comparative Zoology, Cambridge), F. Landru, C. Morlier, G. Guillemain, and all the staff from Viscom SARL (St Ouen l’Aumône, France) provided generous help and advice with acquisition of CT scans. We also thank Sérgio Ferreira Cardoso for his help with the bibliography. LH warmly thanks Robert Asher (University of Cambridge, UK) for introducing him to the development of xenarthrans. We thank two anonymous reviewers and John Wible for their valuable comments on the manuscript. Access to the Helmholtz Zentrum Berlin was facilitated by the European Commission under the 7th Framework Programme through the “Research Infrastructures” action of the “Capacities” Programme, Contract No CP-CSA_INFRA-2008-1.1.1, number ZZ6507-NMI3. For support of the project as a whole, we acknowledge a research grant (F/09 364/I) from the Leverhulme Trust, UK. This work has benefited from an “Investissements d’Avenir’ grant managed by Agence Nationale de la Recherche, France (CEBA, ref. ANR-10-LABX-25-01). This research received support from the Synthesys Project http://synthesys3.myspecies.info/ which is financed by the European Community Research Infrastructure Action under the FP7. Some of the experiments were performed using the μ-CT facilities of the Montpellier Rio Imaging (MRI) platform and of the LabEx CeMEB. This publication is a contribution of the Institut des Sciences de l’Evolution de Montpellier (UMR 5554 – UM + CNRS + IRD + EPHE) No. ISEM 2017-181.